When the weather is nice, students want to be outdoors. The trail behind South Ridge Elementary School serves as a welcome outdoor classroom where everyone can learn in a different environment. Parents, teachers, and Eagle Scouts worked together over time to improve the learning space with a pavilion, benches, and educational signs. Sixth grade students even performed an annual day of trail maintenance as a way to give back to the school when they graduated. One special donation was a “trail tub” on wheels from a group of parents. It’s filled with clipboards, pencils, bird and plant guides, and even a Coleman bird finder that plays 50 different bird calls. “Now teachers have all the resources they need when they go out on the trail with their students,” Wear said. 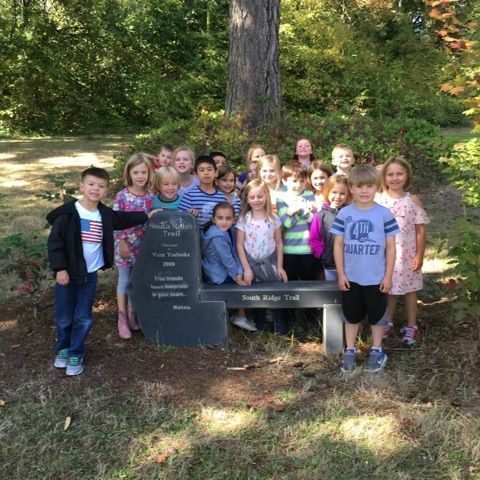 This week, Margo Manke’s first grade students were excited to take their science class to the trail. They used their Full Option Science System (FOSS) kits to study plants along the trail, learning about plant parts and what plants need to live. Margo Manke's first grade class on the trail.